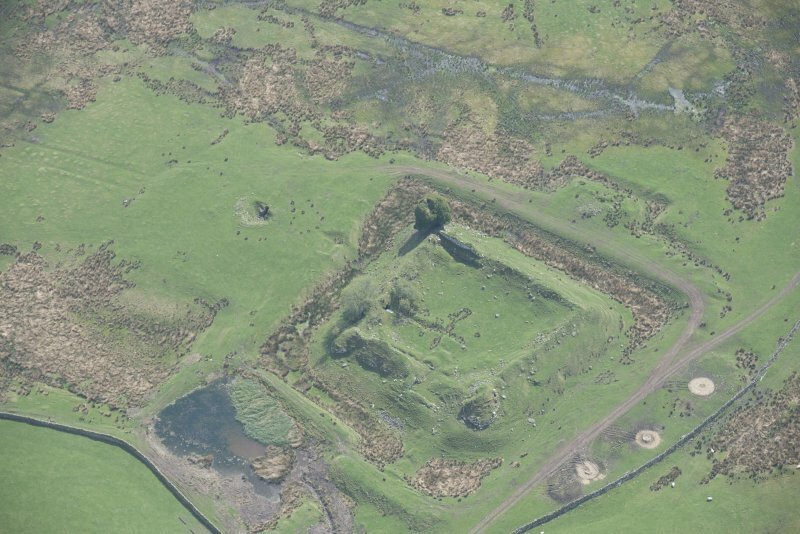 Oblique aerial view centred on castle from N.
Oblique aerial view centred on castle from NE. 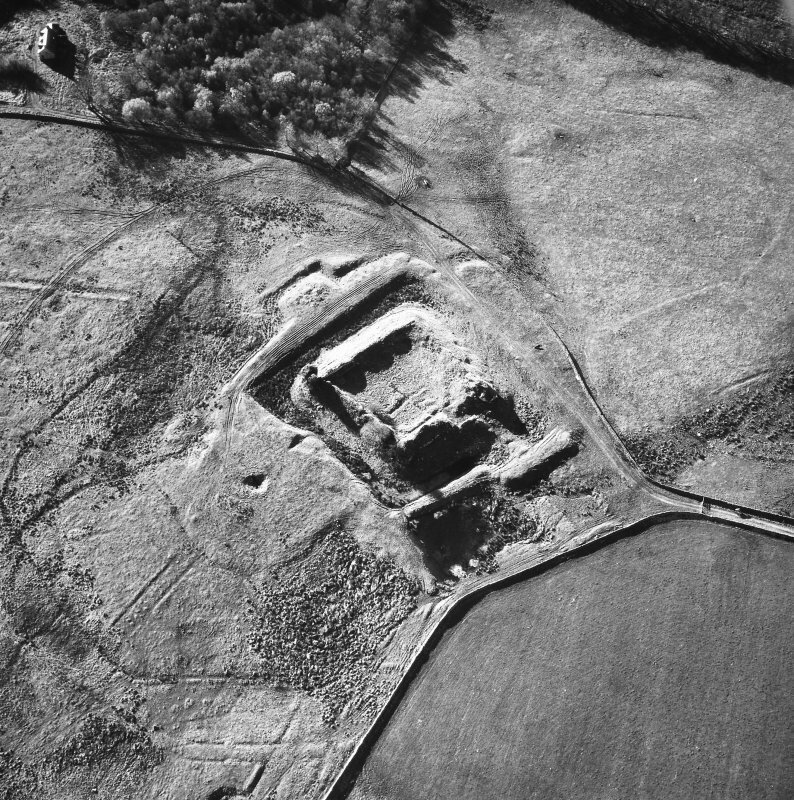 Oblique aerial view of Auchen Castle, looking NW. Photographic copy of engraved view. 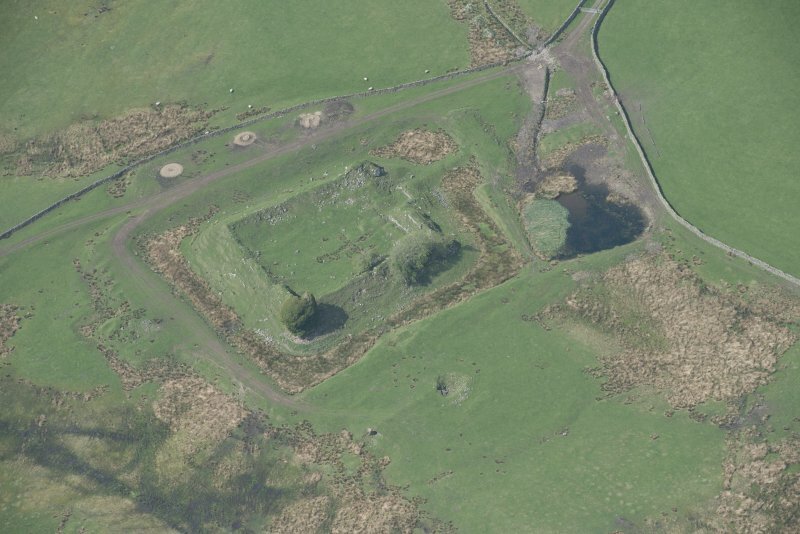 Oblique aerial view centred on castle from E.
Oblique aerial view centred on Auchen Castle. 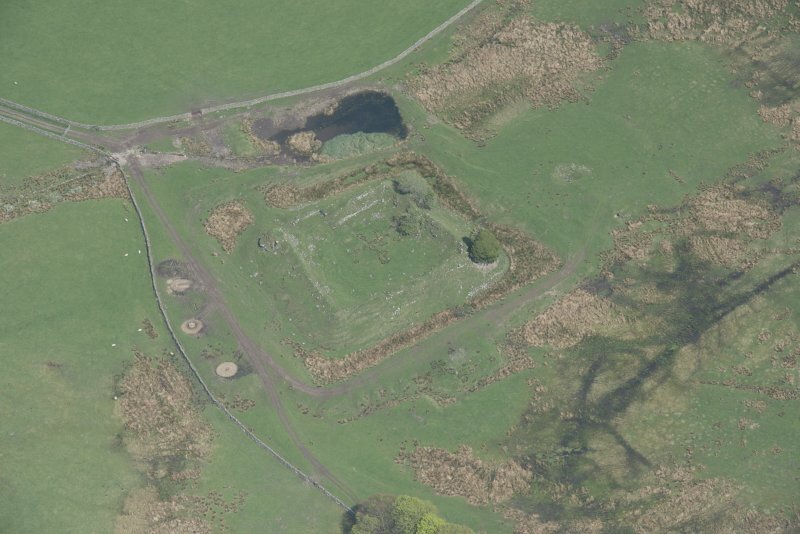 Detailed view of earthworks and ruins, Auchen Castle. 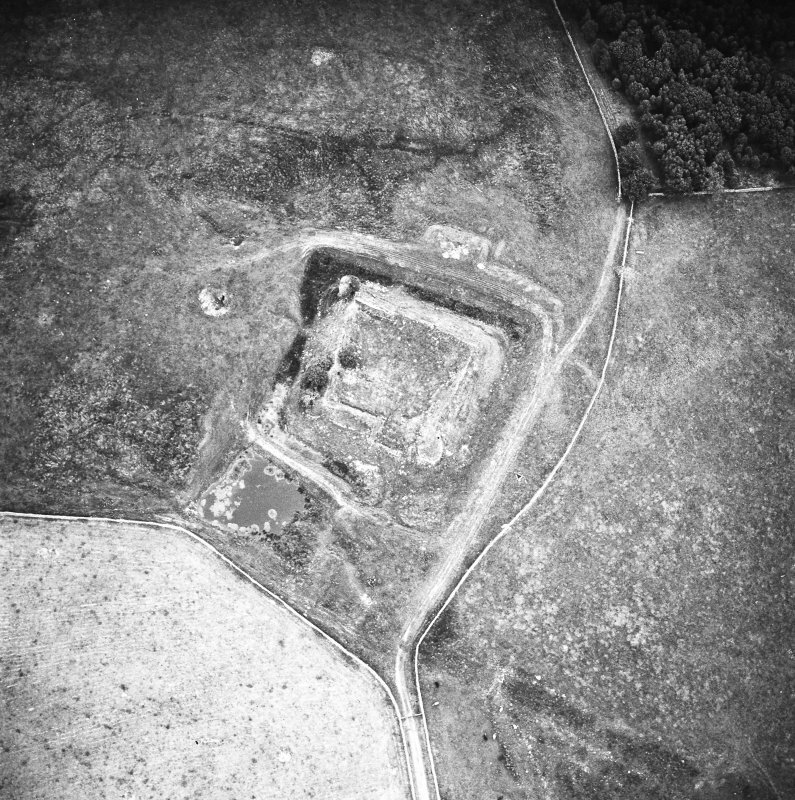 Oblique aerial view of Auchen Castle, looking W.
Oblique aerial view of Auchen Castle, looking WNW. 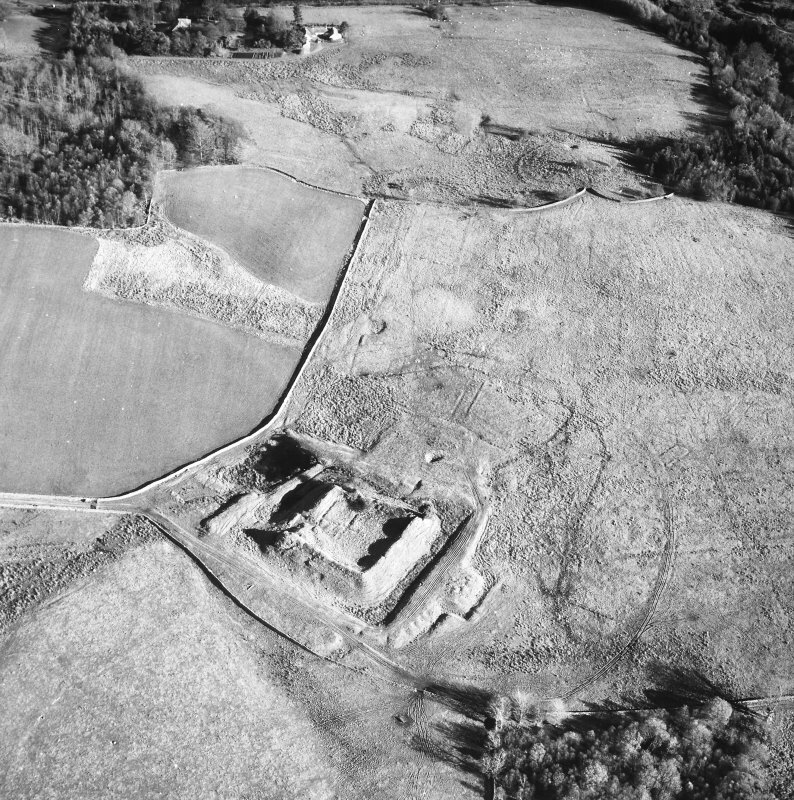 Oblique aerial view of Auchen Castle, looking N.
Plan of Auchen Castle and earthworks, indicating construction phases; redrawn for publication from DC 32476. KHJM, 16 March 1995. 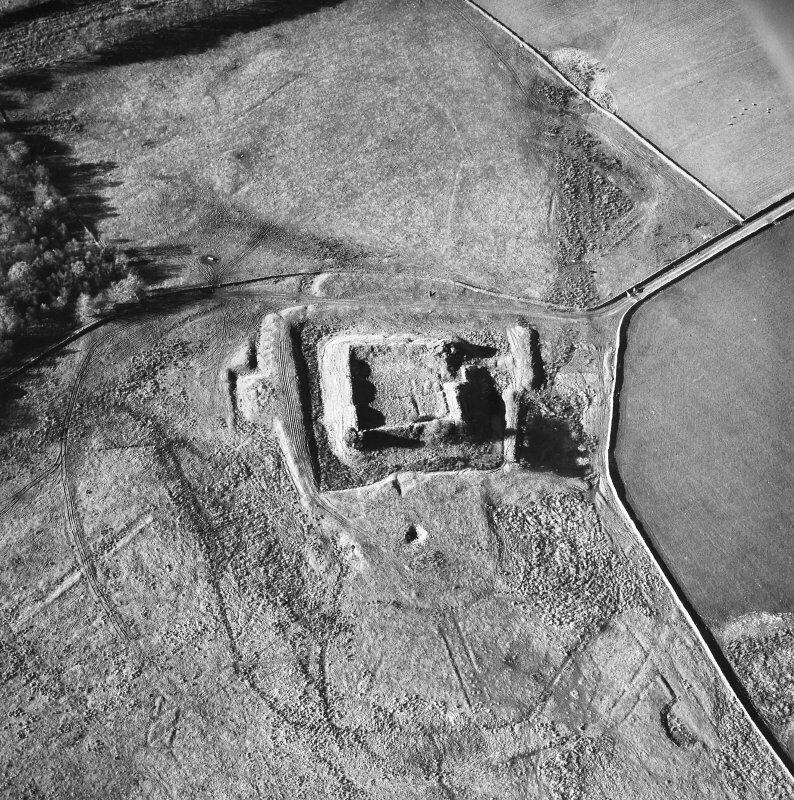 Oblique aerial view centred on Auchen Castle from N.
Oblique aerial view centred on castle from SW.
Oblique aerial view of Auchen Castle, looking NNE. 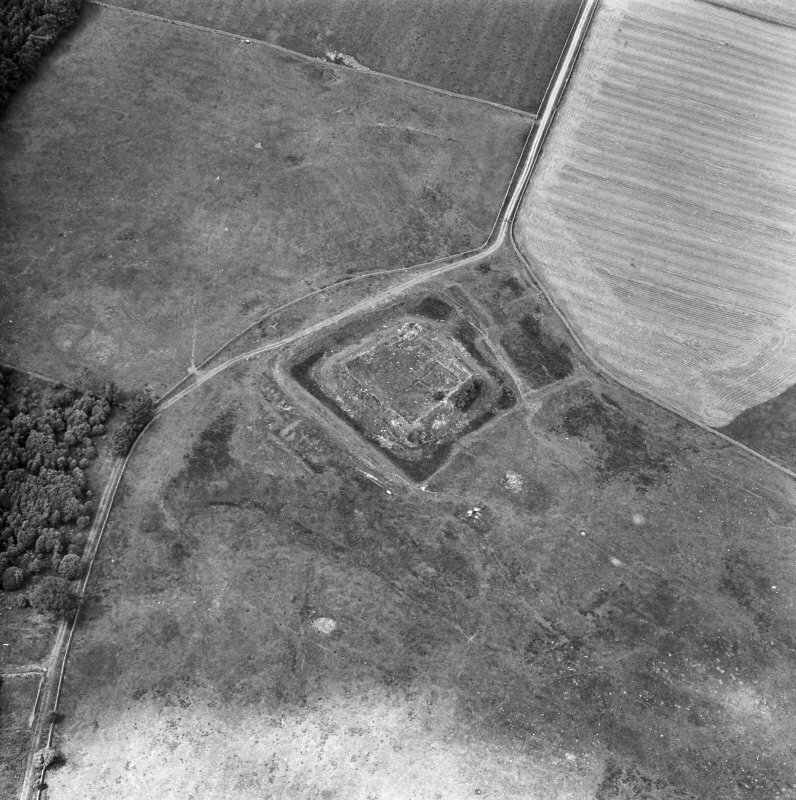 Oblique aerial view of Auchen Castle, looking SE. 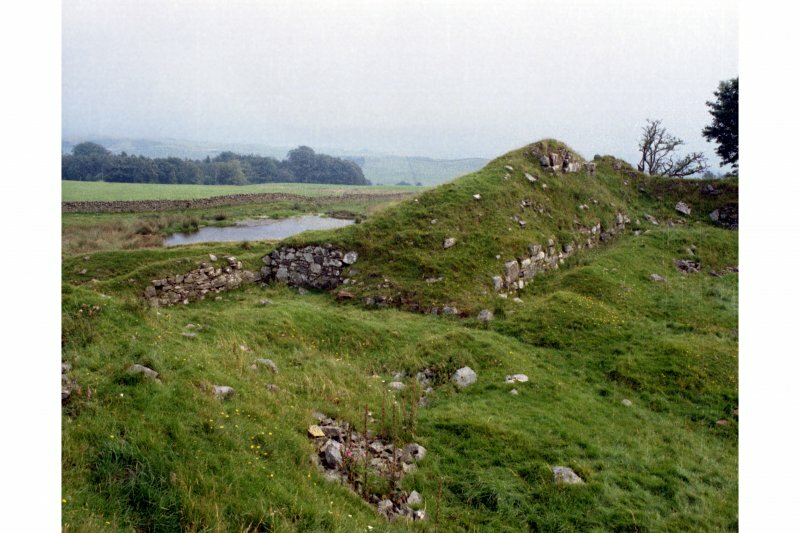 View of enclosure wall with pond behind. 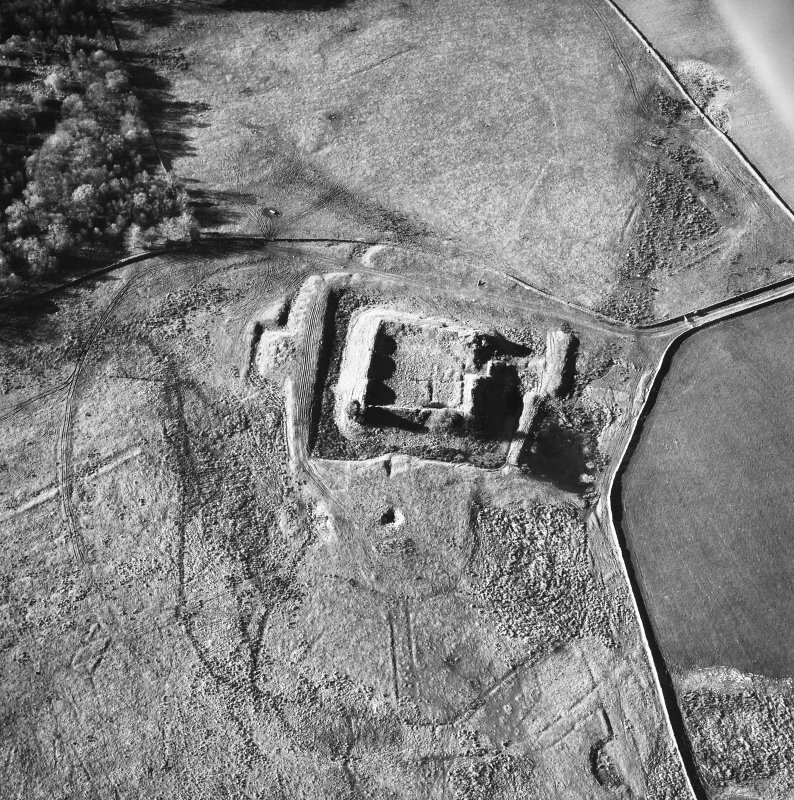 Oblique aerial view centred on castle from S.
Oblique aerial view of Auchen Castle, looking NNW. 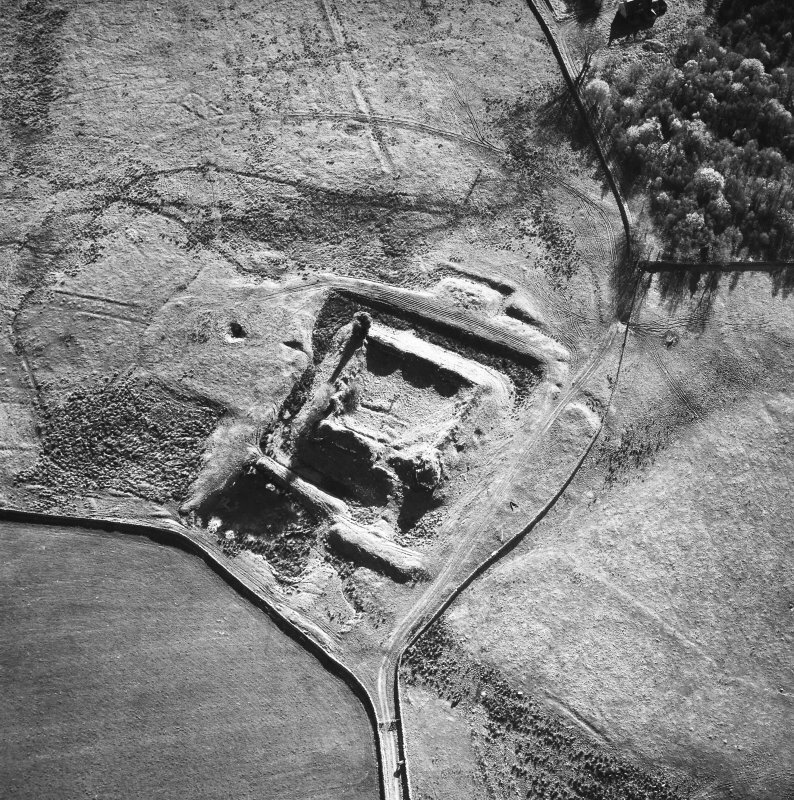 Oblique aerial view of Auchen Castle, looking NE. View of tower, showing construction. For probable predecessor motte or earthwork castle on the Garpol Water (NT 0505 0402), see NT00SE 1. For successor country house (now Auchencastle Hotel) at NT 0625 0471, see NT00SE 121.00. 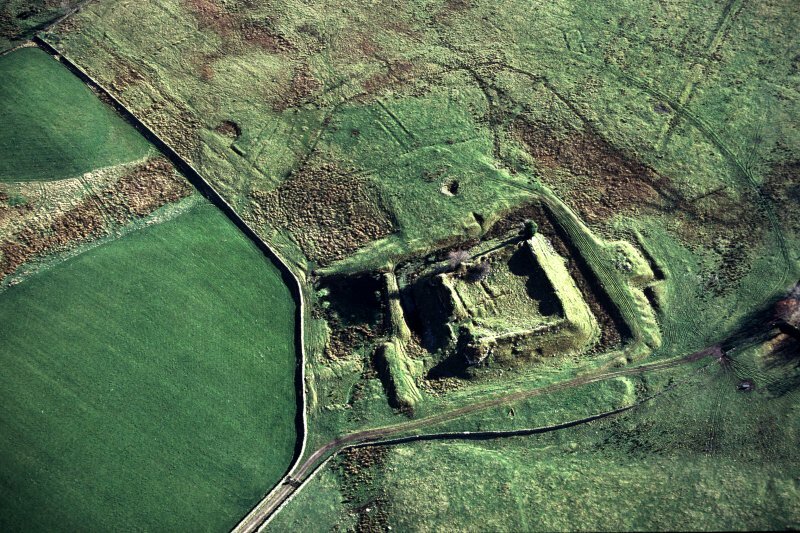 Auchencass or Auchen Castle is situated 1 3/4 miles (2.8km) SW of Moffat, W of the railway, on a marshy plateau, at an altitude of 500 ft (152m) above sea level, overlooking the valley of the River Annan to the E and a deep-wooded ravine formed by the Garpol Burn to the S.
In its entirety the castle, with its elaborate system of outworks, must have presented an imposing appearance, and would be well-nigh impregnable in days before artillery was in use. 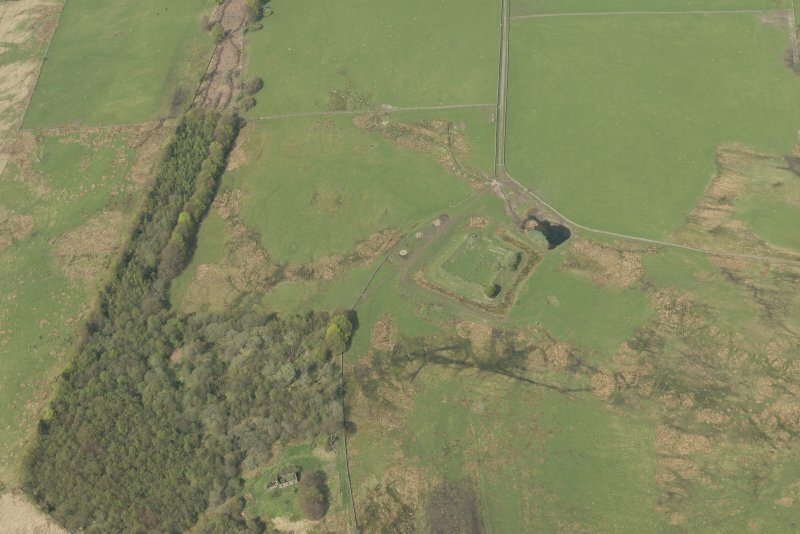 It is built on a late 13th-century plan and comprises, within a great ditch and embankment, a quadrilateral enceinte, which measures some 50 yards (45.7m) either way and is surrounded by a wall 15 to 20 ft (4.5 to 6.1m) thick with cylindrical flanking towers projecting from the four angles. The approach is from the N, crossing an outer ditch and the embankment, whence access to the enceinte would probably be gained by a drawbridge over the inner ditch leading to a forework at the W end of the N wall. The interior arrangement of the courtyard can only be determined by excavation. A walk 5 to 9 ft (1.5 to 2.7m) broad runs along the interior of the curtain wall at a height of some 5 ft (1.5m) from the courtyard level. From this walk a stair in the E wall probably led to a parapet walk round the walls. 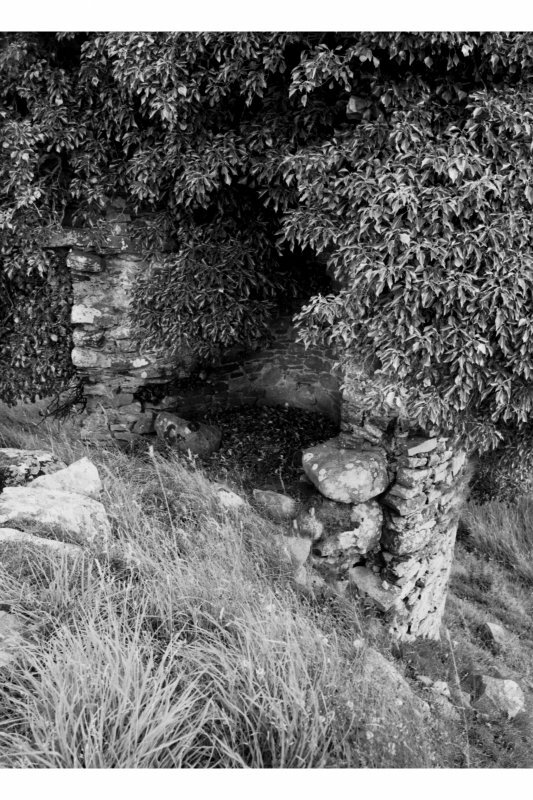 Under the stair is a chamber in the thickness of the wall, 9 ft 3 ins (2.8m) by 4 ft 1 1/2 ins (1.3m), with a recess, probably for a lantern, formed in the E wall. In the floor is a pit draining to the ditch. The SE tower is much later than the others. The wall is only 3 ft (0.9m) thick, and is built of crude masonry. 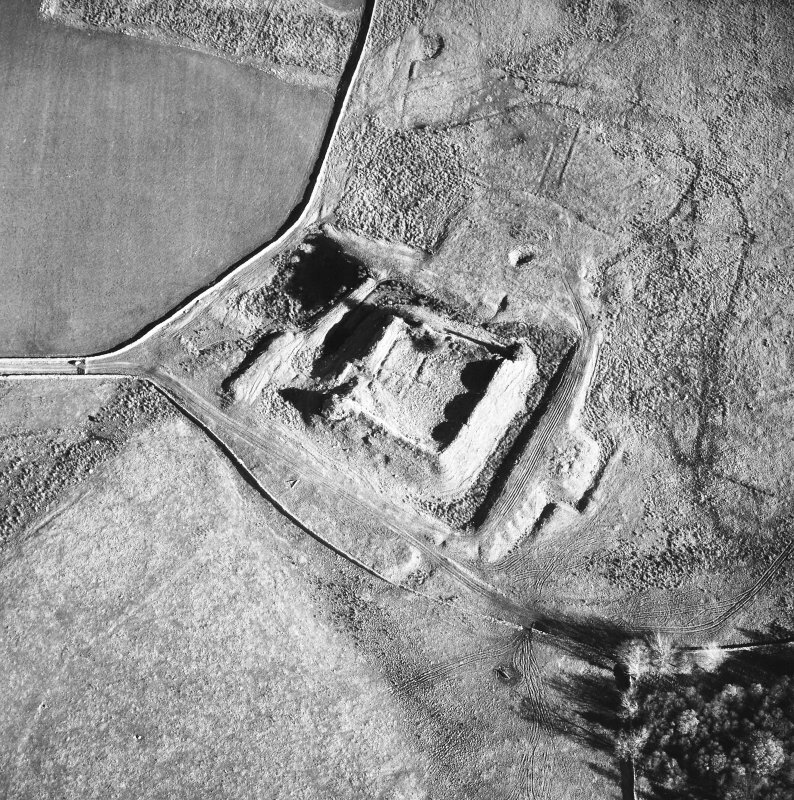 E of the castle, the embankment widens to a plateau, surrounded by marshy ground to the N, E and S. At its southern end is placed, underground, a vaulted passage, running N and S, apparently terminating to the N in a ruinous polyhedronal apartment, now filled with debris. Whether any means of communication existed between this apartment and the courtyard is problematical. The entrance to the passage is secreted at its southern end; adjacent to it is a chamber, doubtless used as a guard chamber if the passage served the purpose of a sally port. The passage is well built, and is 5 to 7 ft (1.5 to 2.1m) high from the present floor level. In December 1306 Roger de Kirkpatrick 'Chevaler' is Seigneur of 'Haughencas', at which time he loans money to Sir Humphrey de Bohun, Earl of Hereford and Essex and Seigneur of Annandale. The place afterwards belonged to Randolph, Earl of Moray, and later on to the Douglases of Morton. 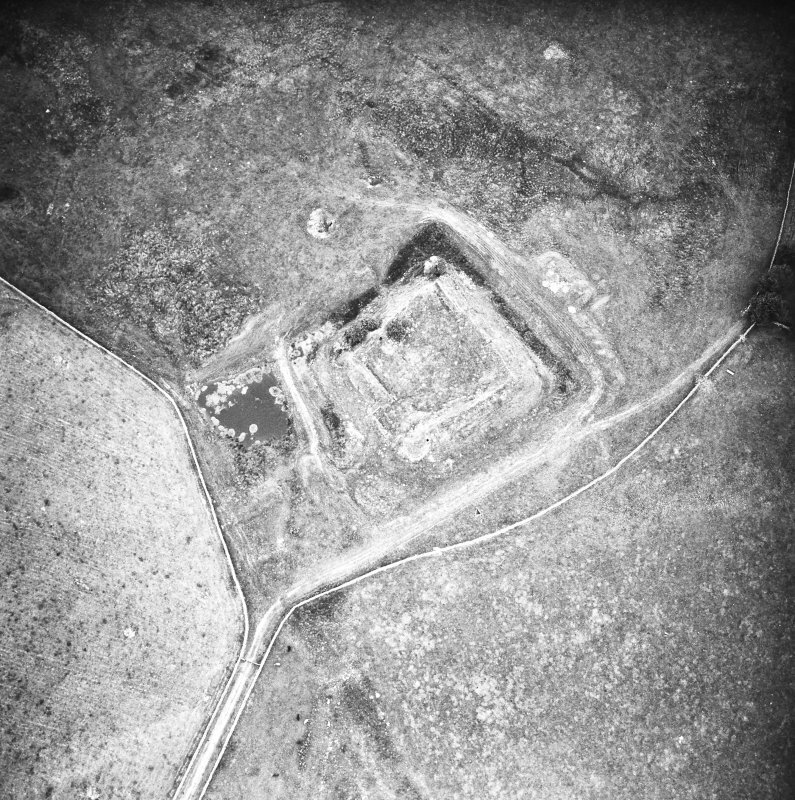 RCAHMS 1920, visited 12 May 1912. 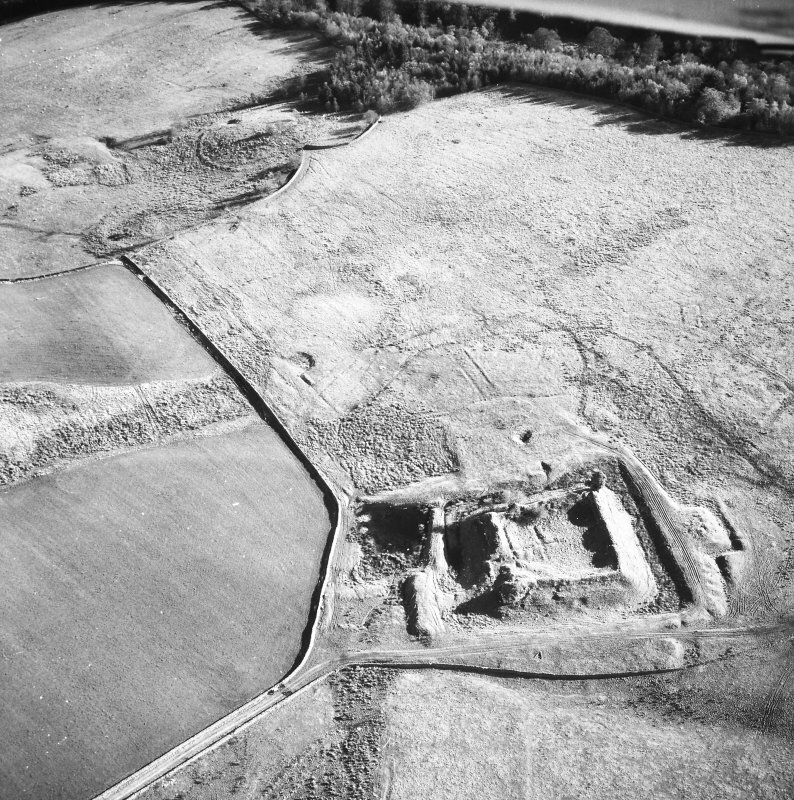 Auchencass or Auchen Castle was built in the 13th century, partially demolished during the War of Independence, and rebuilt in the 14th century, the SE tower being of that date. The "tunnel" is of late 18th century date (H Younger 1931), the architect's plan having been found among Sir William Younger's papers. Excavations were carried out here between November 1924 and January 1925. RCAHMS 1920; R C Reid 1927; Information from A Truckell to OS, 4 November 1958. A moated castle generally as planned by RCAHM. The walls measure up to 5.8m in width and 4.8m high externally. Within the E wall, a passage with corbelled roof, contains a drain running from the castle interior to the moat. A well or storage tank is contained within the NW tower. On the N a small causeway probably of secondary origin leads across the moat. Other than several excavation trenches the interior is featureless. with a well constructed pond-bay and probably contemporary with the castle complex. To the SE and W, outside the moat, and several banks, ditches and amorphous mounds of uncertain purpose and date. Known locally as both Auchen Castle and Auchencass. Visited by OS (T R G) 24 August 1978. 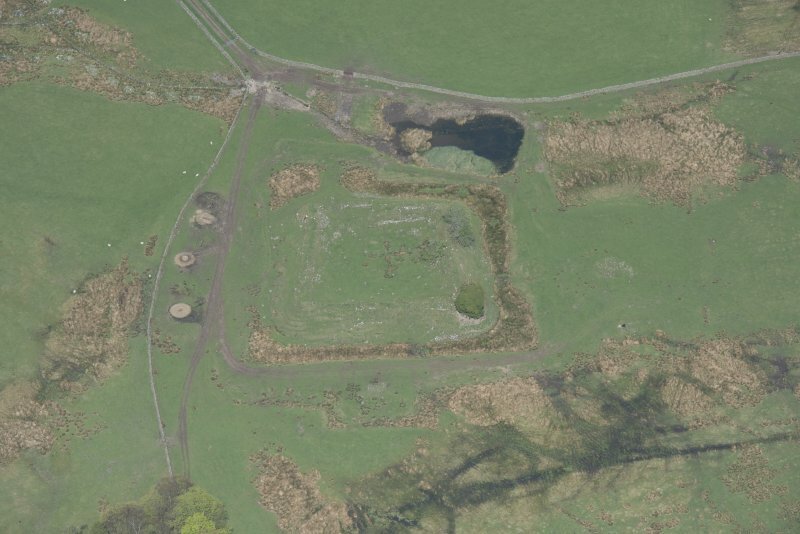 The castle with its impressive array of outworks occupies an area of open and elevated, but poorly-drained, ground which shelves away more gently on the E; improved fields impinge on the W and N, and conifer plantations block the view to the S. The original approach was from the NE, on which side the outworks are supplemented by two ponds which have recently been re-dammed and drain the area of morass to the NNE. The history of the castle can be broken into three main episodes, together with a subsequent phase in which the castle appears to have been emparked. 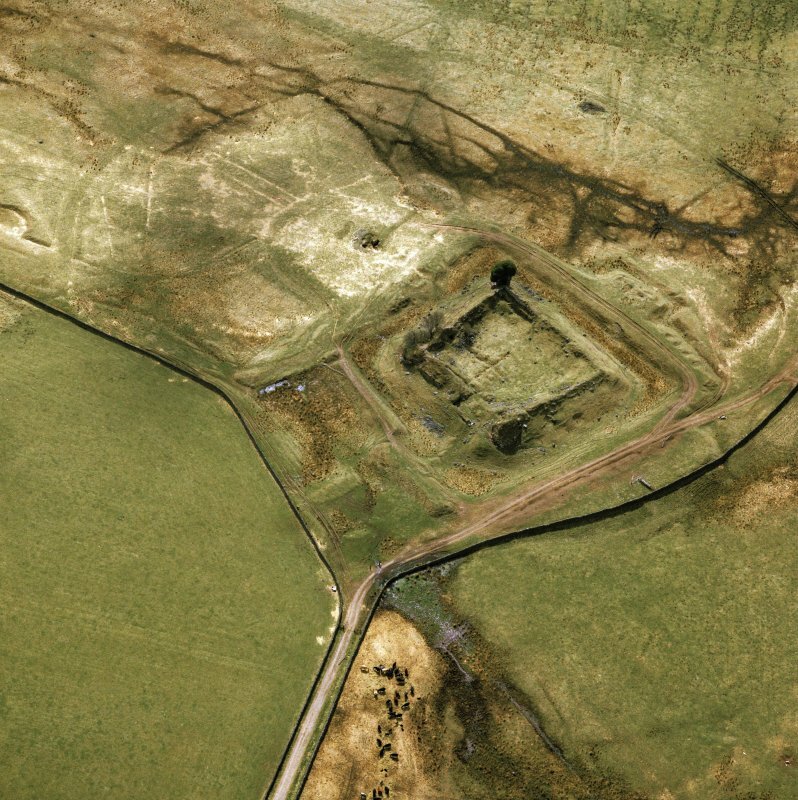 In its earliest form, the castle comprised a quadrangular enclosure, entered by a gateway in the N wall, with a round bastion at the NW angle, and a garderobe chamber in the E curtain-wall. No trace remains of its internal ranges, which were probably of timber. The outworks comprise a broad ditch and containing bank with a terrace, or platform, projecting respectively on the S, W and E sides. 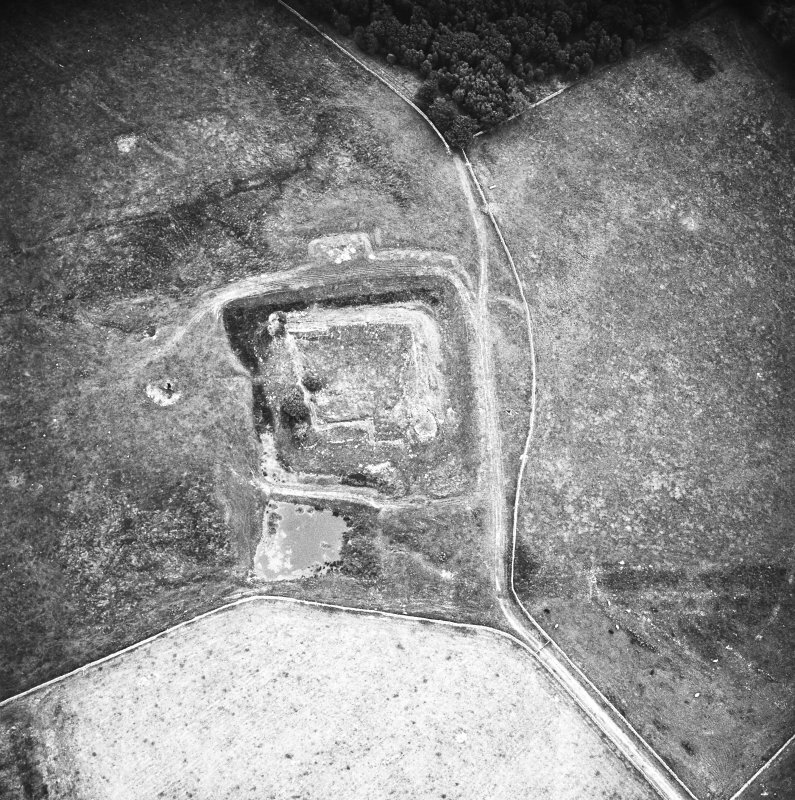 Traces of an external ditch are apparent on the W, while, on the N, defence-in-depth was achieved by the construction of a pair of linked ponds, the approach being across a causeway spanning the ponds and thence, from the outer bank, presumably by way of a timber bridge to the entrance-gateway which was subsequently enhanced by an elementary dog-leg forework, of a type unparalleled in Scotland. 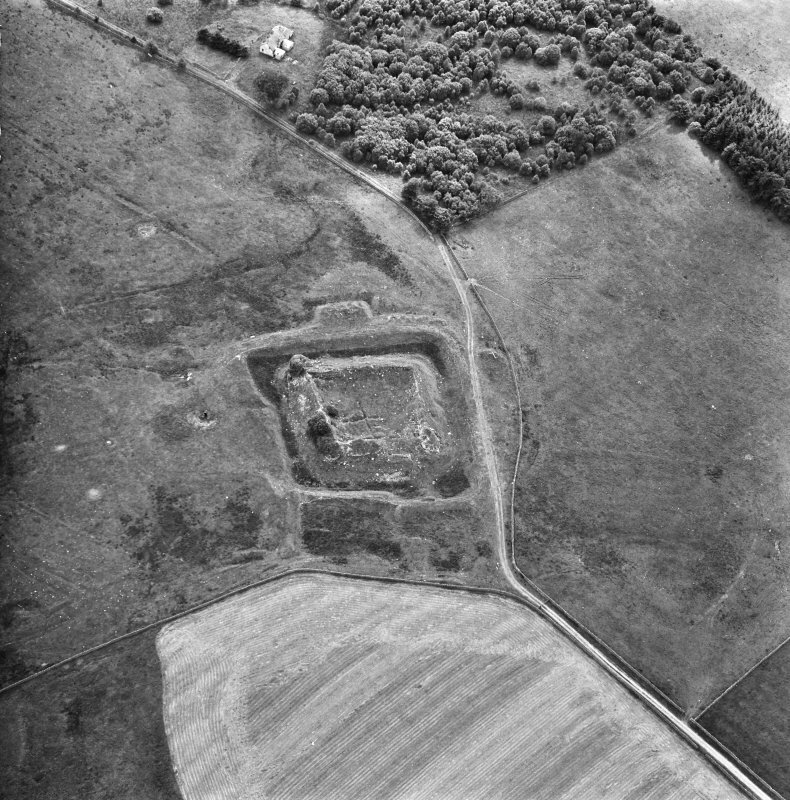 A date in the early 13th century seems probable, and the castle could have succeeded the earthwork castle NT00SE 1, some 1.3 km to the WNW. In 1306 the castle was the property of Roger de Kirkpatrick, 'Chevaler' and lord of 'Haughencas', passing thereafter to Randolph, Earl of Moray, to the Douglases of Morton, and thereafter to the Johnstones of Corehead. In the late 15th or early- to mid- 16th century, the castle was converted for use as an artillery fortification. The present uniform level of the curtain-walls suggests that they were lowered all round while earth-packing was added to the N and S curtain-walls (and possibly also on the W and E); internally, the walls were thickened by the addition of a substantial masonry plinth. The NW bastion was patched and may have been internally consolidated, the garderobe chamber in the E curtain-wall was probably enlarged, and work began on the construction of what may be an artillery platform at the NE angle; in the absence of an internal ramp, this latter work seems not to have been completed. The open-backed D-shaped tower at the SE angle may also be of this period. The outworks were modified, and an external bastion, or caponier-like structure with a long vaulted entrance-passage, was incorporated roughly central to the S platform. 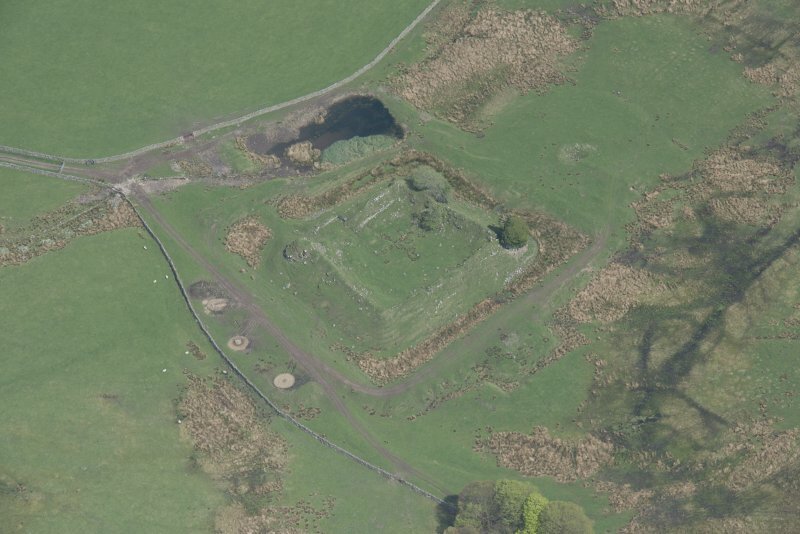 Whilst this structure, which is without precise parallel, is here attributed to the artillery phase and is interpreted in this context, it should be noted that in the past its purpose has given rise to considerable speculation; it is quite possible that both the chamber and passage are later (conceivably late 18th century) and were integral with an above ground structure, 'the three cappit hous' . 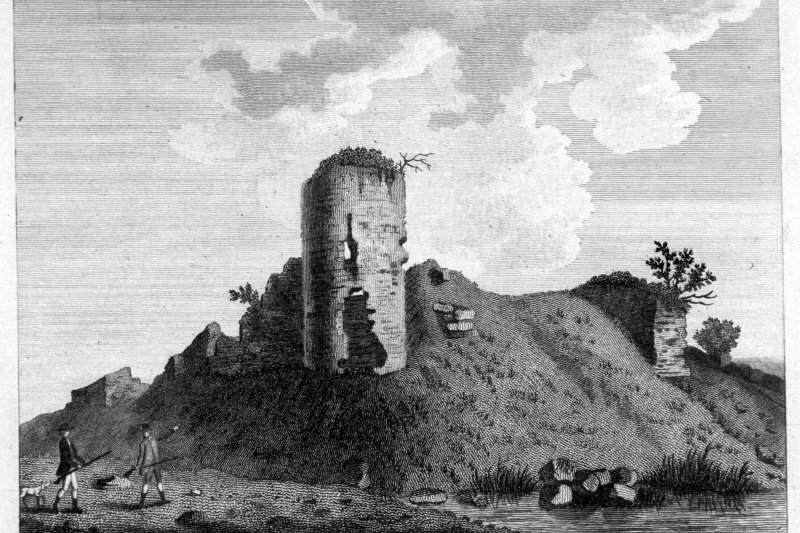 Renovations to the SE angle-tower in the late 18th and 19th centuries suggest that the castle may latterly have been adopted as a romantic ruin or folly within the network of turf-covered road mounds, or carriageways that encloses the castle on the S, E and possibly also on the W.
Excavations supervised and published by Reid included the clearing of the entrance-gateway and forework pend, trenching the interior of the courtyard, and investigation of the S platform together with the passage and subterranean chamber on the E platform. Traces of what may be a masonry building, identified by Reid to the interior of the castle courtyard, may also be of the artillery phase. However, given the limited scale of the trenches opened by Reid, such conclusions are evidently circumspect. (Period I, The Masonry Castle). The earliest work in the castle is the curtain-wall, 2.8m to 3.3m in thickness, which encloses a quadrangular courtyard measuring 36.5m from N to S by up to 40m transversely. Due to the later thickening, much of the curtain-wall is obscured and it is the thickening, rather than the curtain-wall itself, which is most evident today. The curtain-wall extrudes from the top of this later accretion and is apparent for a greater part of its circuit. Extant portions include that beside the entrance in the N wall, the inner face of the NW angle and, most notably, at the N end of the E wall where a free-standing section of the outer face of the curtain-wall rises to a height of 5m. To the interior, it is the later thickening which is the most conspicuous feature of the site today, consolidated by a masonry revetment composed of massive boulders, roughly coursed, which extends around each side of the quadrangle broken only at the entrance-gateway, to the rear of the NW bastion, and beside the garderobe in the E curtain-wall. The curtain-wall is of an unusual build in that its wall-core is packed with earth and only the faces of coursed rubble are built with lime mortar. By comparison, the masonry of the entrance-forework is of a high standard, consisting of a boulder-and-rubble infill built to a course and mortared. Much of the outer face of the SE tower, which is of later construction, is obscured by ivy. The rubble used in its build is much smaller and might almost be described as 'garden bond', with only rudimentary boulder footings and no visible dressings. Internally, the tower has been extensively repaired, probably in the 19th century and/or more recently. The surviving faces of the curtain-wall are plain and built without any visible footing course. However, on all sides, a sizeable free area of ground (up to 4m) was left between the foot of the curtain-wall and the inner lip of the enclosing ditch. This perhaps reflects the poorly-drained nature of the site and the builders' wish to avert the threat of subsidence. A notable feature of the curtain-wall is the complete absence of original openings other than the entrance-gateway and the E garderobe chamber. The entrance-gateway has been reduced to its lowest courses; it is formed of red sandstone ashlar, is 2.2m wide externally, was arch-pointed, of two orders, chamfer-arrised, and rebated for a two-leaved door. The entrance-passage is internally splayed and the jambs at the rear are rebated. This would indicate the presence probably of a second pair of doors, at the rear of the passage, opening directly to the courtyard.A notable feature of the 13th-century entrance-gateway is that it is asymmetric to the N curtain-wall, being drawn in close to the NW bastion. This suggests that the two were designed as integral elements, the purpose of the bastion presumably being to afford the entrance a measure of protection close in. In its present form the NW bastion has an earth-and-rubble infill as high as it stands, but it is unclear whether this was an original feature or is the result of later consolidation. However, the form of the bastion, on comparison with the late 13th century round towers at Tibbers (NX89NE 2) and the failure to fully engage the bastion by breaking the internal angle of the curtain-wall (the pattern at Tibbers), would imply that access from the courtyard at ground level had been intentionally precluded. This would suggest that the bastion may have had a consolidated earthen fill, at least in its lowest stage, from the start. 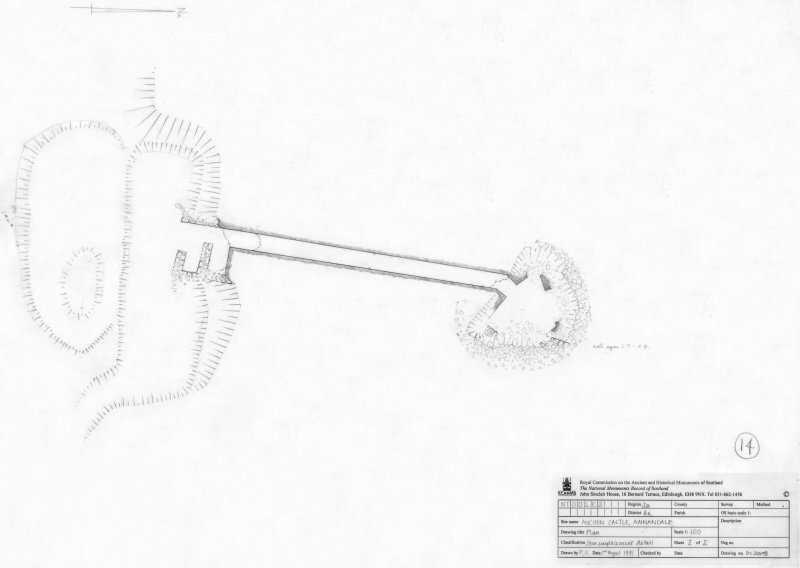 What appears to be a small lintelled opening on the NE side of the bastion (1.25m above ground level) is more likely to be a displaced stone or a put-log hole. The garderobe-chamber is immured in the E curtain-wall and entered directly from the courtyard. 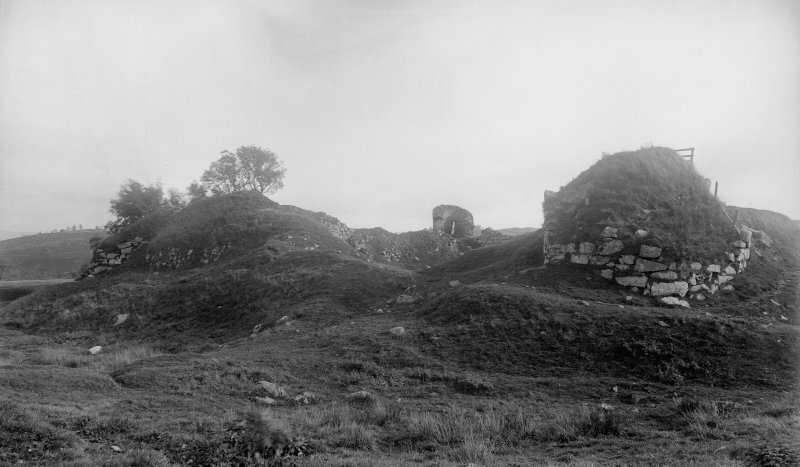 Although probably an original feature of the castle, it appears to have been subsequently enlarged, probably in the artillery phase. The evidence for this is tenuous and rests on an apparent straight-joint in the S wall of the chamber, corresponding with a break in the corbelling above, which closely approximates to the inner wall-face of the curtain-wall. Moreover, Reid notes an external straight-joint between the internal projection of the garderobe on its S side and the inner face of the curtain-wall, and, although much of the masonry has since fallen, his observation seems to be correct. Internally, the chamber is roughly rectangular on plan (2.26m by 1.5m, and up to 2.75m high). The floor level is split by a drain, 0.75m wide and up to 2m deep, which extends the length of the chamber on its S side. Two large sockets in the S wall, corresponding with the scarcement of the chamber, served to secure the timber joists for a suspended floor over the drain, whilst above these (0.7m above the scarcement) three further joist sockets presumably served to secure the seat (probably a three-seater); an aumbry is incorporated in the N wall. The ceiling of the chamber is corbelled square and capped with a flagstone. The garderobe was flushed by a stone-lined drain which extends for a distance of 13.6m from the centre of the courtyard. The drain, 0.7m wide, up to 0.5m deep and originally lintelled, was investigated by Reid who drew attention to the presence of what appears to have been a stone building set end-on to the drain on its S side. The nature of this building is uncertain but it may have been erected in the artillery phase. Within the garderobe chamber itself, the floor of the drain pitches steeply to emit beneath the curtain-wall (the wall being corbelled over the outflow at this point); both the entry- and exit-points of the drain are now choked with debris. 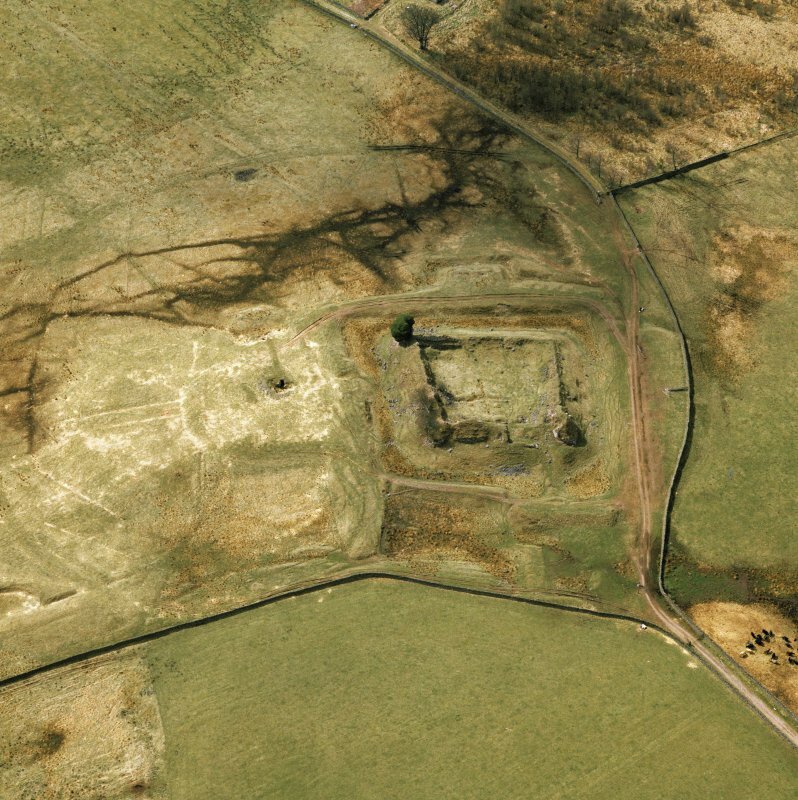 Excavations by Reid to the perimeter of the curtain-wall, however, revealed the outflow. The water source for the drain is unclear but given the unusual proportions of its channel, a sizeable flow must have been envisaged. This is problematical as there is no obvious source of water. There may have been a well within the courtyard from which water could have been sluiced or, alternatively, a supply may have been piped from elsewhere, perhaps from the outer ditch. The author of the Statistical Account notes that the castle 'had been supplied with water by a leaden pipe, part of which was lately dug up?. (Period II, Entrance-forework). A straight joint between the curtain-wall and the forework, is a clear indication that the forework is secondary. The forework is of an elementary type consisting of a simple dog-leg drawn out in front of the entrance in the form of a pend. The footings for the external jambs of the forework remain in situ and, on the basis of Reid's excavation, the pend and entrance-passage seem to have been paved throughout. Although without parallel in Scotland, analogies for the forework are to be found in a number of early Crusader castles. A garderobe-chute contrived in the SW angle of the NW bastion, between the bastion and curtain-wall, is secondary and the footings of the bastion are accordingly displaced to accommodate the outflow; the rubble wall-core, which is exposed at the base of the chute, is consolidated with lime mortar. This feature cannot be precisely dated and it may well belong to the succeeding phase. (Period III, the Artillery Phase). In what was probably a single episode of short duration, the masonry castle and its outworks were remodelled for use as an artillery fortress. The present roughly uniform height of the curtain-wall suggests that it may have been deliberately lowered all round. The NW bastion was patched using much coarser masonry and boulder pinnings, and, as noted, may have been internally consolidated with earth. At the NE angle, the curtain-wall was buttressed on the E and consolidated with a rudimentary bastion formed of rough-hewn stones crudely heaped together. This bastion may have been intended for use as an artillery platform, or else to buttress a weak angle in the curtain-wall, but this is unclear. Within the castle, on the N, S and E, the curtain-wall was consolidated by the addition of a plinth formed of roughly hewn blocks. The plinth may also once have extended along the inner face of the W curtain-wall, but this is by no means clear and the ground-surface on this side of the courtyard is anyway much disturbed. Externally, the curtain-wall was enhanced, on the N and S, by the addition of earth piled up and held in place by a rudimentary wall-face. The wall-face is best preserved to the front of the N curtain-wall, while, on the S side of the castle, several stretches of a corresponding wall-face can be traced 2.5m to 2.8m in front of the curtain-wall. The W and E walls may similarly have been thickened, but evidence for this is lacking on the W, while, on the E, an accretion of soil against the curtain-wall may be no more than a product of natural processes and decay. 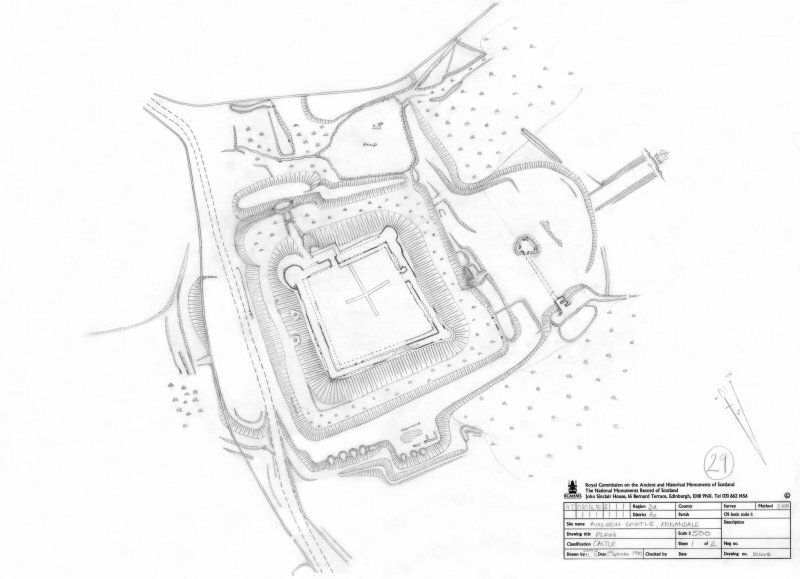 To this period may also belong the modification of the E garderobe-chamber, the insertion of a garderobe-chute as part of the NW bastion, and the stone building identified by Reid end-on to the drain within the courtyard. The SE angle tower is difficult to comprehend. It is open-backed and D-shaped on plan, and bears no resemblance to the NW bastion, although the rudimentary boulder footings on which it stands could have provided the stance for an earlier tower or bastion at this angle, though this seems improbable. The tower abuts the external angle of the curtain-wall. On the E, the masonry of the tower is crudely stitched back onto the outer wall-face of the curtain, while on the S there is a straight joint between the two. The tower lacks any dateable feature and whilst clearly secondary to the curtain-wall its relation to the thickening is ambiguous. There is a high-level internally splayed, lintelled window-opening on the SSE side of the tower, and the jambs of two other openings in corresponding positions, possibly also windows, are present in the exposed wall sections at the rear. These latter openings are unusual in that their sills are corbelled forward from the wall-face. The recladding of the inner wall-face (19th century, or more recent) has obscured any evidence for a corresponding floor level. An engraving of 1791 shows the tower in a parlous condition and with a breach in its wall-face which has subsequently been infilled. The more recent repairs to the tower, combined with a thick covering of ivy, precludes any more detailed analysis. However, a parallel for the tower might tentatively be drawn with the open-backed E tower incorporated in the artillery fortification at Threave Castle (NX76SW 7) erected by the Douglases about 1455, and, as Auchen Castle would also seem to have been one of their properties, the SE tower could be of this period and be a product of the same circumstances. Alternatively, the tower may be no more than an 18th-century folly. In the context of the artillery fortifications, if of this period, the purpose of the tower may have been to provide an elevated vantage point over the outworks and open ground to the E, from which direction the principal threat seems to have been envisaged. (The Outworks). Combining elements of more than one phase, the outworks were probably intended as the first line of defence for the 13th-century castle, as later. Enclosing the castle, there is a broad ditch which was probably water-filled. The ditch is up to 12m wide and at least 2m deep, and at least in part it is probably rock-cut; an expanse of outcrop is visible on the E lip of the western ditch. Traces of a masonry wall-face at the N end of the E ditch may indicate that the outer face of the ditch had been entirely faced in stone to prevent erosion. Containing the ditch there is a broad bank which is swung out on three sides to accommodate a central platform, or outer ward: on the W the bank was enhanced by a substantial platform (up to 21m broad), with traces of an external ditch beyond; on the S, by a platform with an outer ditch and counterscarp bank; and on the E, by a substantial platform which takes the form of an apron (up to 50m by 50m overall). 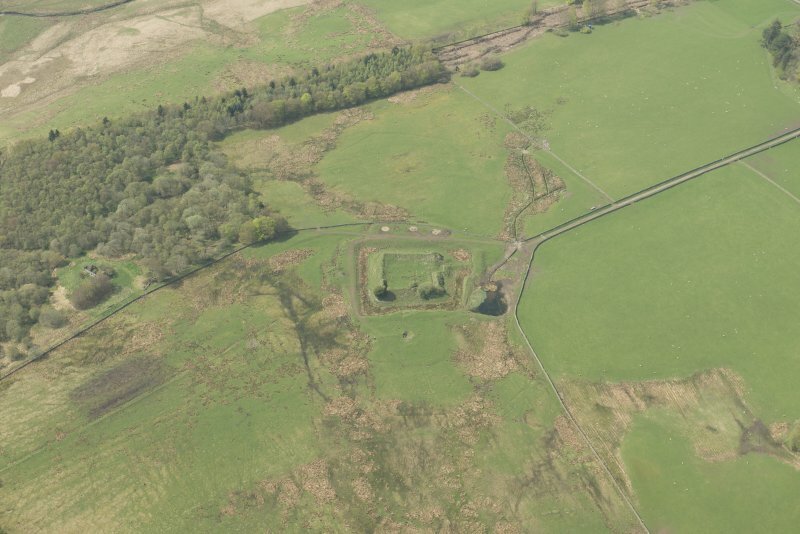 In their original form, the outworks would probably have been enhanced by the provision of a palisade (as in the case of Lochmaben in 1299); the respective platforms, or wards, in times of danger would most likely have been used to deploy stone-throwing engines in defence of the castle. 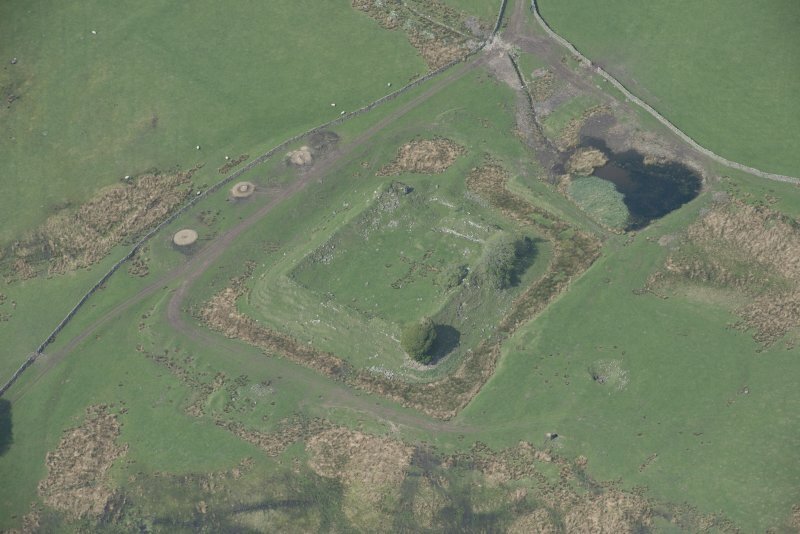 Large outer enclosures bounded by earthworks are to be found at other important castles as at Lochmaben (NY08SE 8), Lochleven (NO10SW 9) and Cadzow (NS75SW 8). 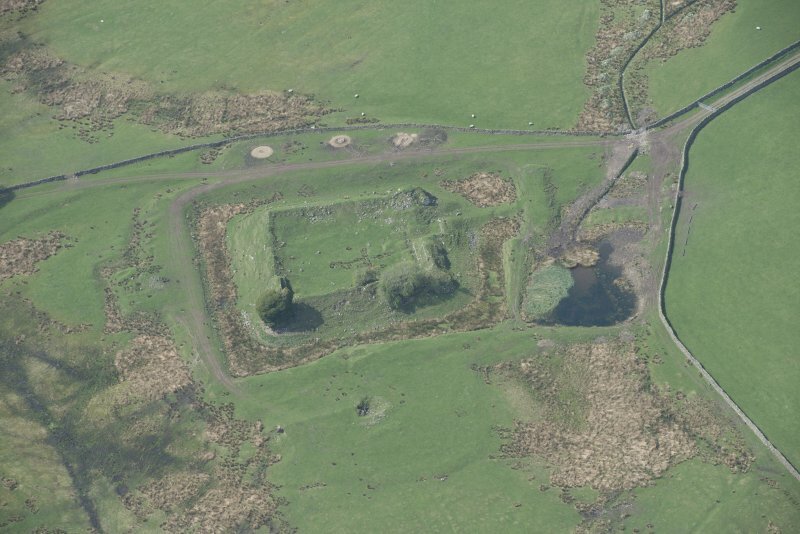 The main approach to the castle was from the N and on this side defence-in-depth was achieved by the excavation of two ponds, fed by a spring draining an area of morass some 40m to the NNE, and dammed on the E by an earthen bank. Crossing the pond from the landward side and on the same axis as the castle's entrance-gateway, there are the truncated remains of a causeway, probably the original line of approach. It may once have extended as far as the outer bank and from there have been carried across the ditch by a timber bridge. However, at some stage, probably in the artillery phase, the section of bank opposite the entrance was recut and bodily moved forward about 5m to form a bulwark. Recent cattle erosion reveals that it has a substantial rubble core. A quarried depression on the S side of the removed section of bank is the result of Reid's unsuccessful attempt to locate a bridge abutment. A low turf-covered rubble spread (up to 3m broad), possibly a causeway, spans the base of the ditch in front of the entrance-gateway. Its purpose is unclear, but it may have been intended to provide access from the bulwark to the entrance, or else to act as a dam to retain water in the western ditch; the central portion of the causeway has since been removed, presumably to allow free drainage between the respective ditch segments. In the artillery phase, particular attention seems to have been invested on the apron attached to the containing bank to the S of the castle. It is possible that it was from this direction that the principal threat was envisaged. The approach from this side is open, offering an uninterrupted and easy ascent from the direction of Beattock, whilst from the platform itself, activity stemming from Moffat Dale could be easily observed. The function of the apron on this side, along with the platforms on the S and W sides of the castle's outworks, can now only be generally surmised. However, each was probably intended for use as an artillery emplacement, for which protection would presumably have been afforded by the provision of earth-filled hurdle-work and baskets. (The External Bastion). 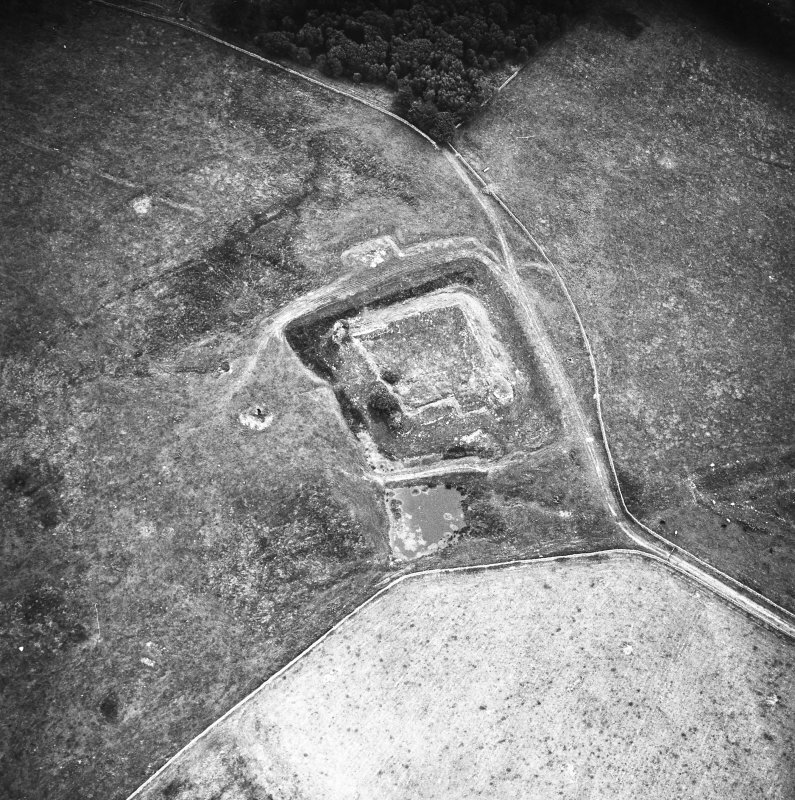 The principal feature of the S apron, and placed roughly central to it, is an unusual structure which, in terms of its form and probable function, might best be likened to an external bastion or caponier-like structure (a concealed, low profile emplacement for artillery and light arms). It consists of a chamber, set almost entirely below ground level, entered by a long vaulted passage that extends to the eastern edge of the apron. 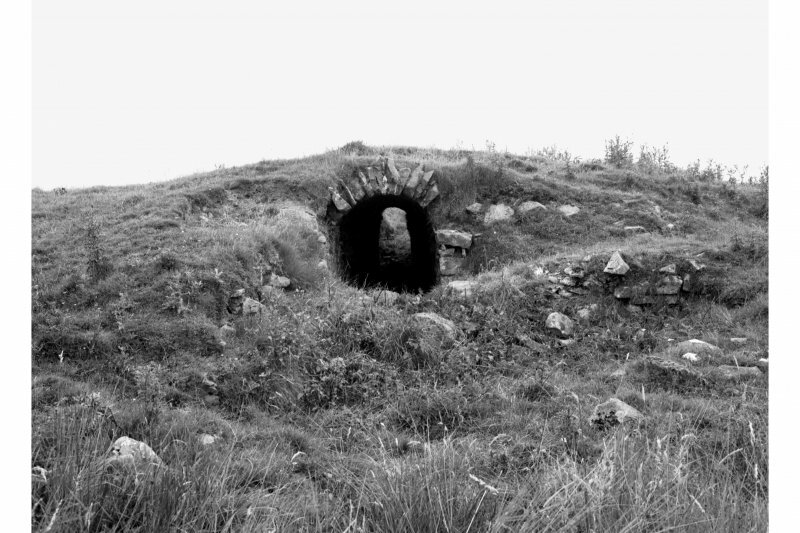 At the S end of the passage, on the E side of the present entrance (though the passage probably originally extended a further 3m to the S), there are the remains of two small chambers set side-by-side, both of which were vaulted (perhaps magazines); the springing for that on the N survives. While, in front of the passage's entrance, in low-lying ground at the foot of the apron mound, there is a subrectangular depression contained in part by a low counterscarp bank, the remains perhaps of a emplacement for light arms, or musketry. The passage itself is well-formed and barrel-vaulted, and measures up to 24m in length, 1.25m in width and 2.2m in height to the soffit of the vault. 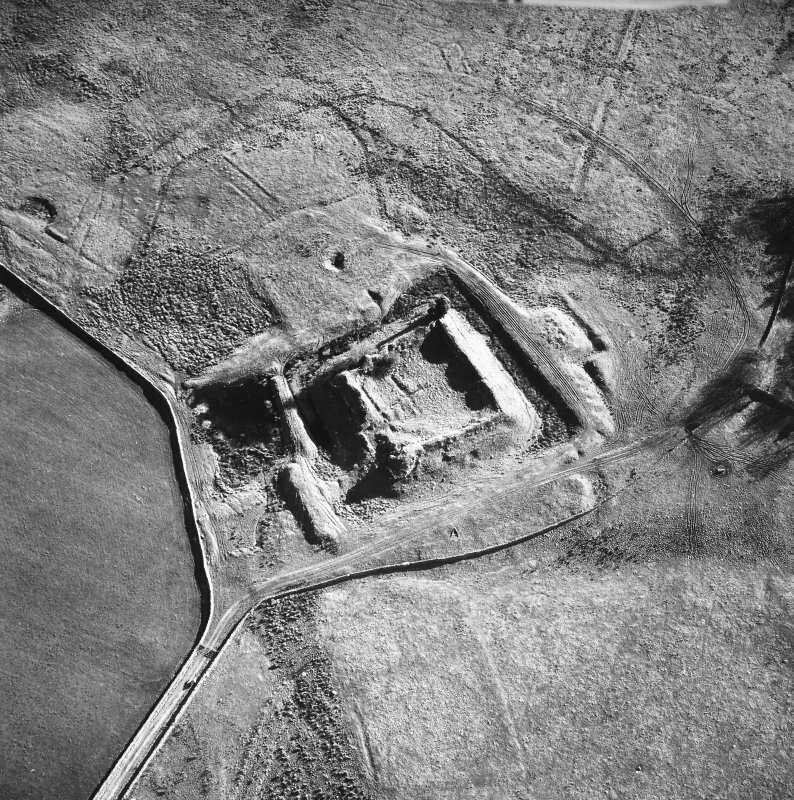 It was constructed in a trench which was subsequently infilled, with probably only a thin layer of earth and turf concealing the extrados of the vault. The entrance from the passage to the chamber itself is bent through 45 degrees (assuming the chamber was used to store munitions, this may have been so designed to prevent a flash-back running the length of the passage should there have been an explosion). The chamber, which is essentially triangular on plan with each angle squared-off in the form of a facet, measures 4.1m from N to S by up to 4.1m transversely within walls of mortared masonry up to 1.4m in thickness and 1.8m in height. The walls of the chamber project up to 0.2m above ground level, the NNW facet incorporating at ground level the sill and jamb of a splayed embrasure with a scarcement beneath. Although not apparent today due to the build up of debris within, Reid records that the SSE angle of the chamber was cut by a half-round conical facet with a semi-circular niche on its SSW side. It is unclear what this feature represents, nor is it apparent whether the chamber itself was originally roofed or open. The chamber, with its concealed entrance and low-level embrasure, is probably best interpreted as a semi-concealed gun emplacement, or bastion, perhaps, for a culverine pitmoyen (the smallest type). This would seem to require that the chamber be floored and, although there is no evidence for a scarcement running the full length of the chamber, a timber floor could have been joisted or have been supported by posts. 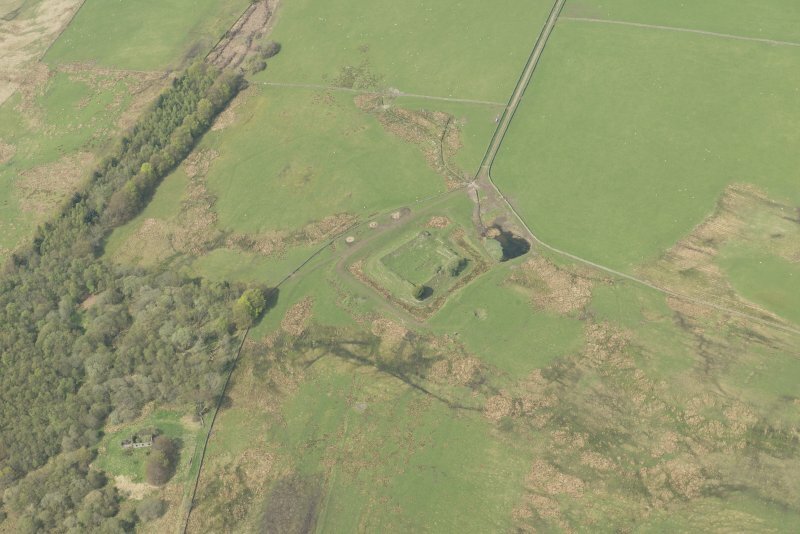 The advantage in placing a detached bastion central to the S apron would have lain in the greater visibility and the field of fire which could be commanded from this position, as opposed to the castle, which, while only 20m distant, has a more restricted outlook. The entrance to the passage, on the E side of the apron, seems to present a particularly vulnerable position from which to gain access to the chamber. Nevertheless, this degree of exposure could have been overcome by provision of hurdle-and-earth screens, or other forms of barricade, which need leave few archaeological traces. Reid notes that 'on top of this chamber, within living memory, was a modern erection in the form of a cottage, which was used by the proprietors as a convenient luncheon place for their shooting parties. The design of the cottage is not known, but it must have followed the peculiar shape of the chamber beneath it [indeed, it may even have incorporated part of the existing fabric]. It was crowned with a triangular roof sloping away from its apex in three faces and was thus known as the 'three cappit hous'. The Royal Commission suggested that the chamber and passage might be part of a sally-port from the castle but this was conclusively disproven by Reid. 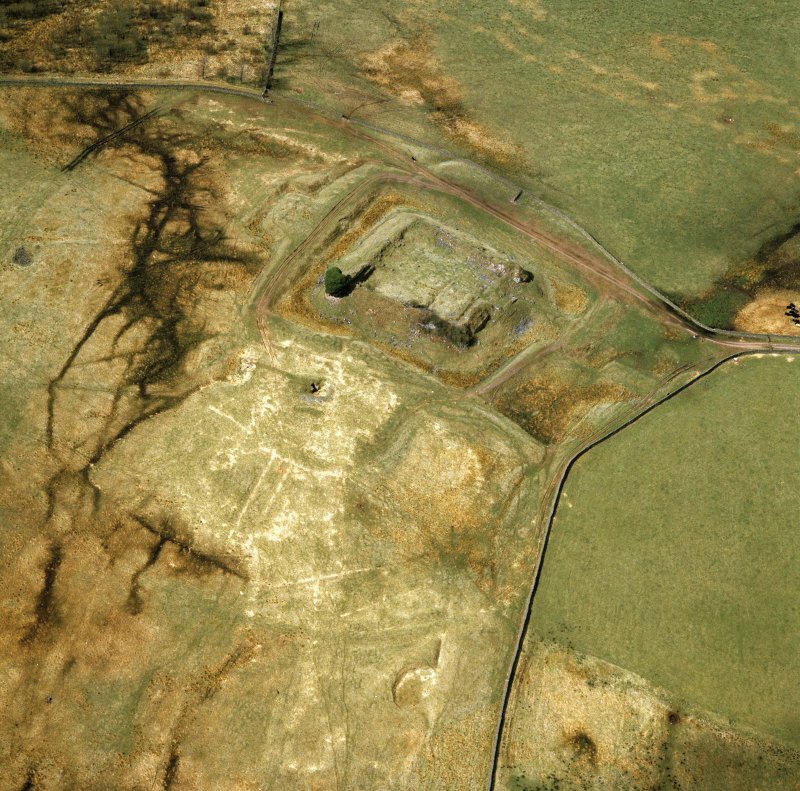 A mounded subrectangular depression roughly central to the N edge of the apron, cut into the counterscarp bank (7.2m wide and up to 1m high), incorporates the turf-covered remains of a rectangular stone structure, possibly a building or chamber. It measures 4.1m from NNE to SSW by 1.4m transversely, up to 0.4m in depth internally and is open-ended on the S, at which point the counterscarp bank is cut by a trench. Both this structure and the 'three cappit hous' are depicted apparently roofed on the first edition of the OS six-inch map (Dumfriesshire, sheet xvi, 1861). The South Platform. The S ditch has the appearance of having been recut, probably in the artillery phase, and it is possible that the platform built out from the containing bank on this side may also have been enhanced. On the summit of the platform there are vestiges of a mortared stone wall, perhaps a parapet wall. A trench excavated by Reid across the surface of the platform revealed, over a greater part of it, 'a very thick layer - fully one foot deep (0.3m) - of wood ash and charcoal, evidence of a very big conflagration'. Reid interpreted this as the result of bringing together timber used in the palisaded defence of the outworks, heaping it up on the platform, and firing it. Cut into the W edge of the platform and the S edge of the adjoining bank, there are six hemispherical depressions. Their purpose is unknown but they may be the wasted remains of a bank of corn-drying kilns. 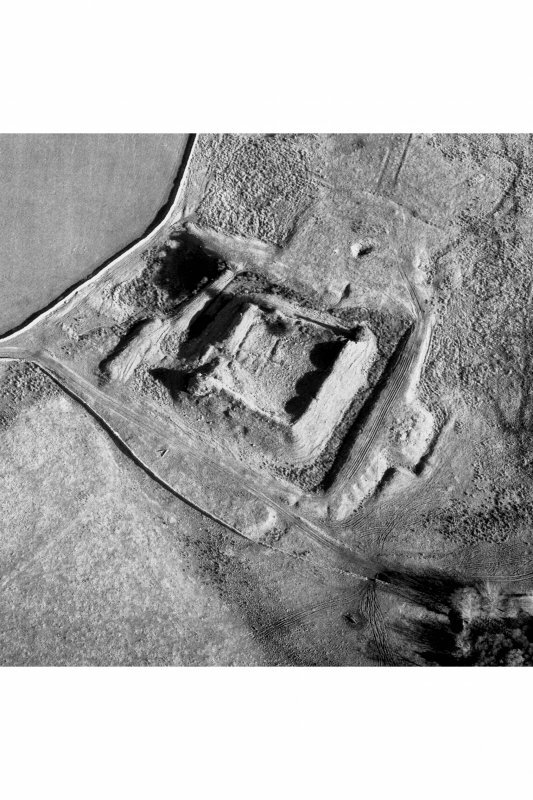 Visited by RCAHMS (IMS, PC), February 1993. R C Reid 1927; NMRS, MS/820/2. (Name cited as Auchencass). Substantial remains of a late 13th century castle of enclosure probably constructed for the Kirkpatricks who held it in the first decade of the 14th century; in 1306 Roger de Kirkpatrick, 'chevaler' was lord ('seigneur') of 'Haughencas'. 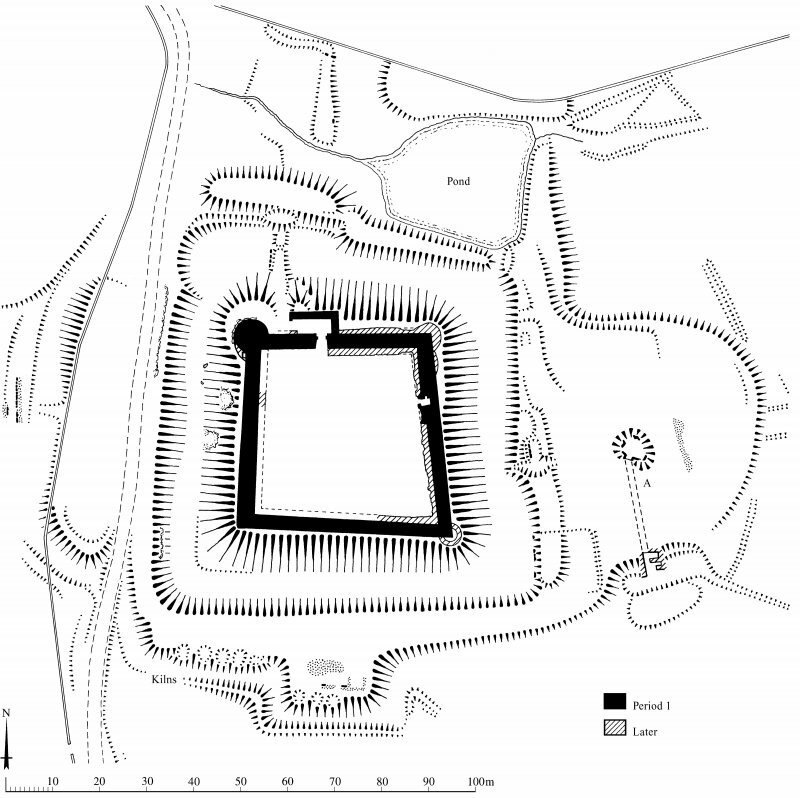 The defences are all roughly square on plan, first an outer rampart (probably intended to be palisaded), next a ditch, then a mound (again, probably palisaded) higher than the rapmpart, and finally a stone-walled enclosure. [Scheduled area includes fish ponds (to N of castle) and tunnel (to SE)]. Information from Historic Scotland, scheduling document dated 18 March 2010.